California has over 300 miles of beaches, those that most residents and visitors think about are the ones consisting of find-grained white sand, whether Santa Monica, San Diego, Santa Barbara or Carmel. But there are also some interesting anomalies. One of California’s strangest beaches sits 30 miles south of the picturesque north coast town of Mendocino and just 3 miles south of Point Arena along Highway 1. 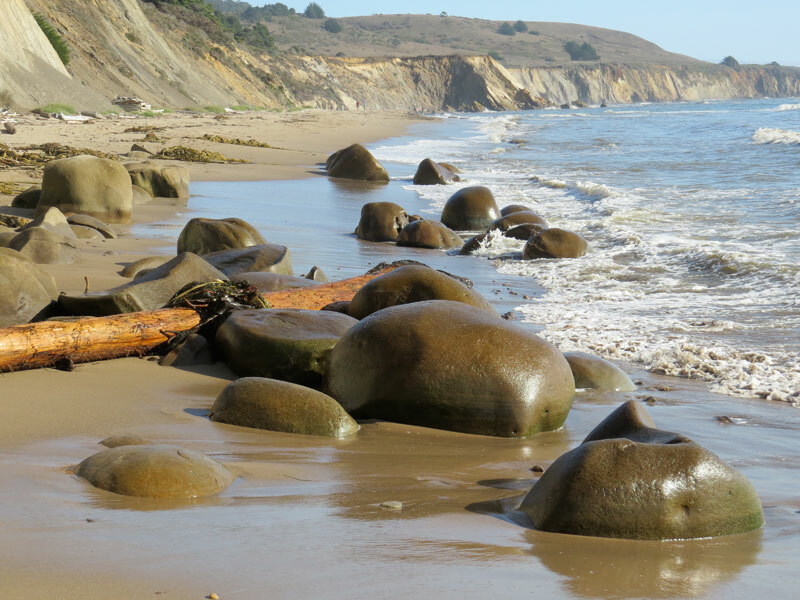 At low tide, Bowling Ball Beach is covered with hundreds of 3- to 4-foot diameter, round, sandstone concretions that look like massive bowling balls that have collected on the beach. Concretions are hard, often spherical or rounded masses of sedimentary rock formed when a mineral cement, often silica or calcium carbonate, fills the spaces between individual grains. 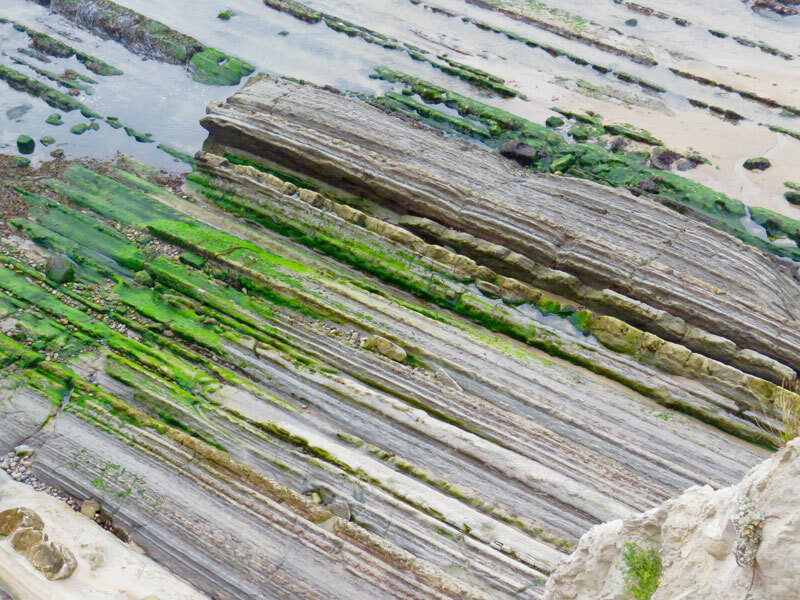 These structures typically form around some hard object, a shell, pebble, or even a bone or tooth, after the sediment has been deposited but before it has completely hardened to rock. Because of the cement, concretions are nearly always harder than the surrounding sedimentary rock and therefore typically remain behind when the surrounding material is weathered or eroded away. 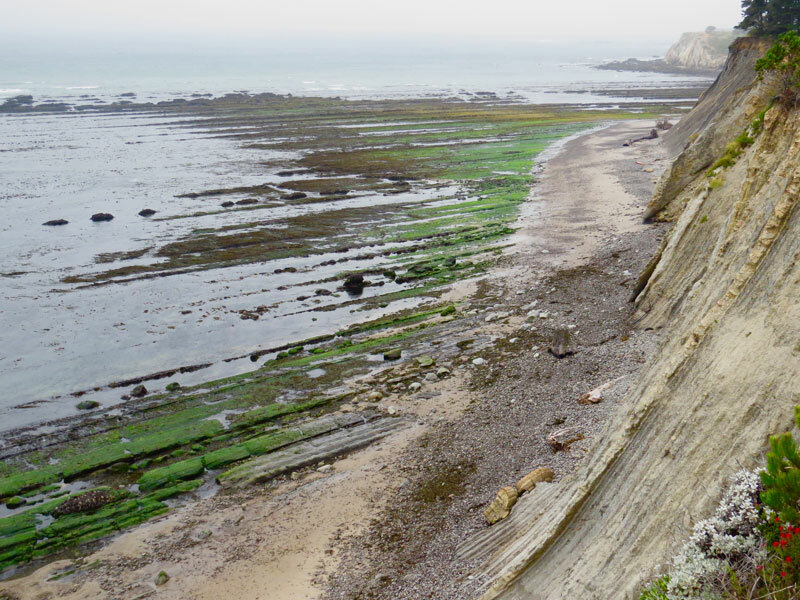 The cliffs backing Bowling Ball Beach consists of sandstone and shale that has been uplifted and now tilt at very steep angles down towards the shoreline. 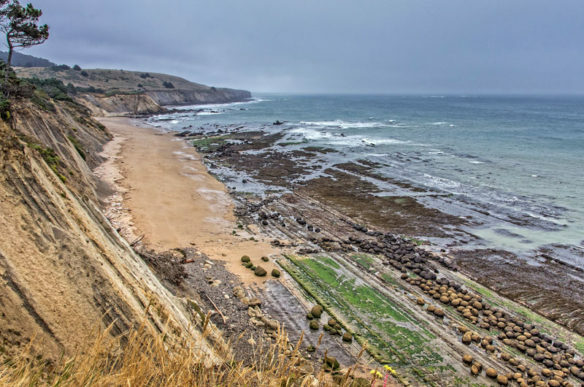 The sandstone tends to be harder and more resistant to erosion than the shale, such that the harder sandstone layers extend across the intertidal zone as ridges, giving the very wide wave-cut platform a corduroy appearance at low tide. 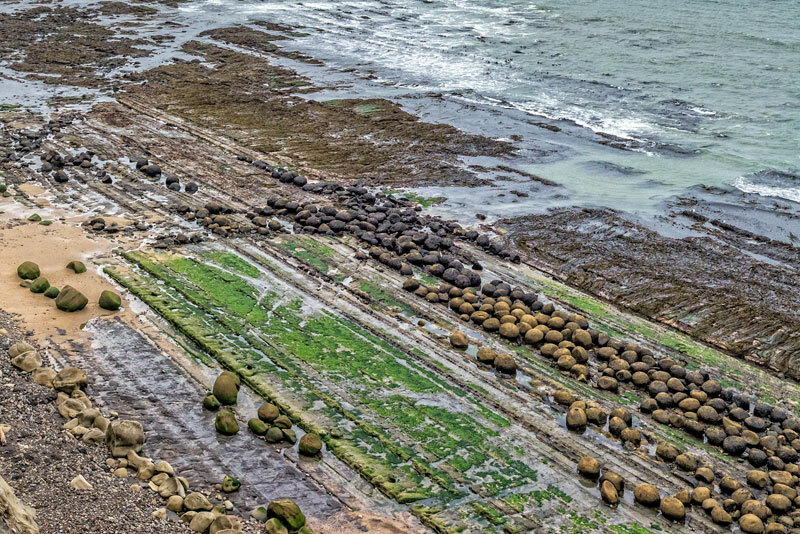 Many of these large round concretions have been eroded out of or are still attached to the sedimentary rocks exposed on the intertidal platform. Solution from immersion in seawater and wave action over time has gradually detached many of these boulders, which have been moved around and now are concentrated in the bedrock grooves or troughs that have been eroded into the upturned rocks, much like bowling balls in the gutter of a bowling alley. 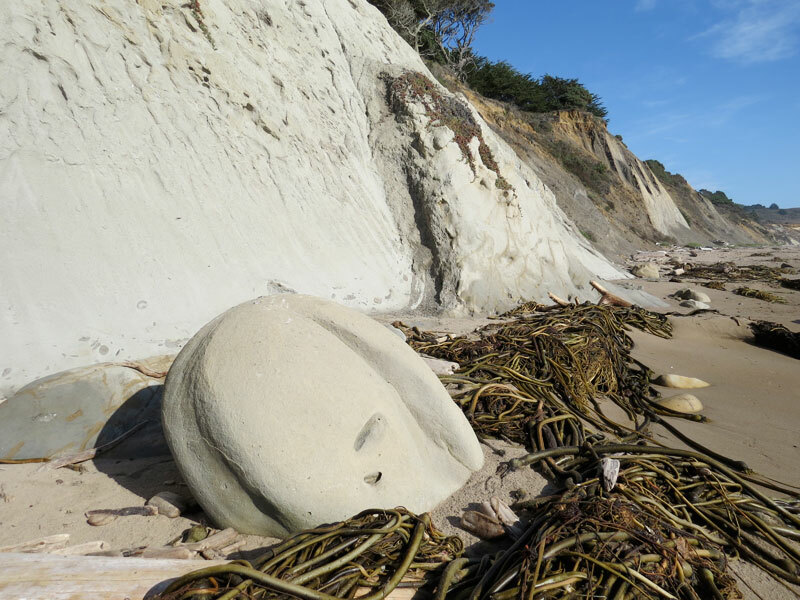 Other concretions appear to have been dislodged from the adjacent cliffs by the processes of rainfall and runoff, and then have rolled down to the beach and been moved around by wave action. 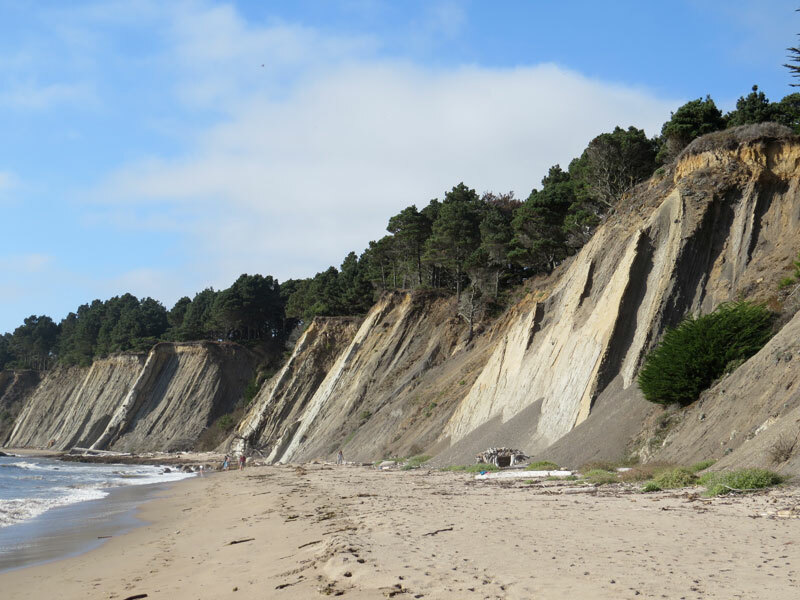 The beach is accessible from California State Highway 1 and is part of the Schooner Gulch State Beach. A trail leads north from a parking area down to the beach. But you need to make sure you plan your visit at low tide to best observe the bowling balls. It’s a little hike, but well worth the effort. 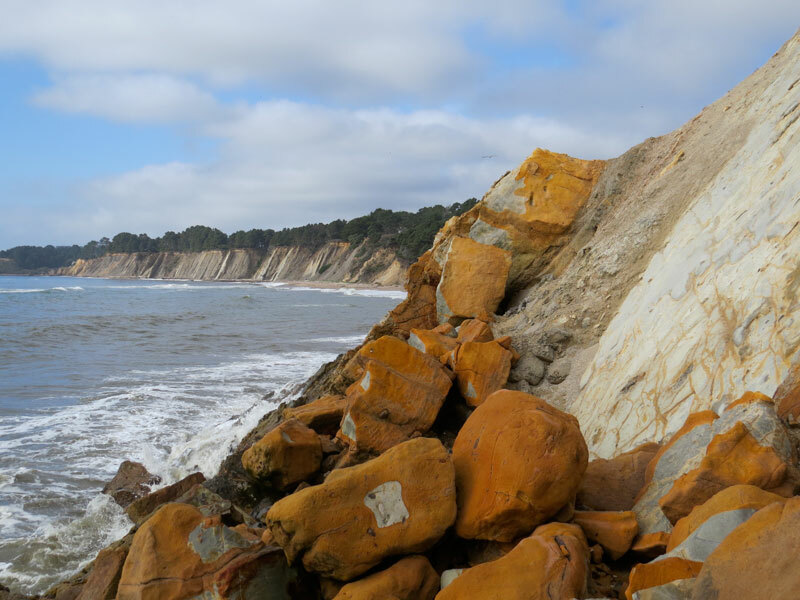 For the less adventurous, or if you don’t have the hour to hike down to the beach, you can also stop on Highway 1, directly across from a small country road (Bill Owens Road) and at low tide, get a good view from the top of the steep cliff. The steeply dipping cliffs are nearly as interesting as the bowling balls themselves and create what have been called flatirons. 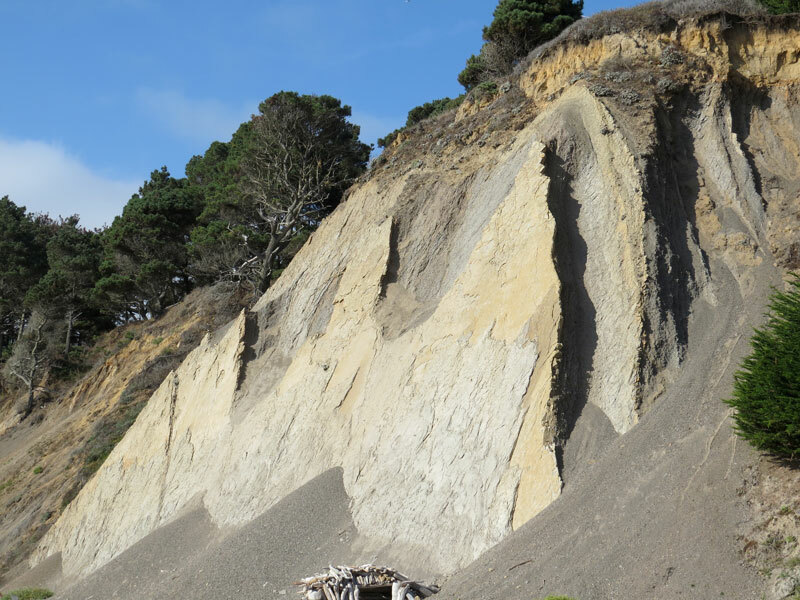 Similar rocks are exposed at the base of the Santa Ynez Mountains along the northern Santa Barbara County coast near Gaviota Pass, and also in the mountains above Boulder, Colorado, which are actually referred to as the Flatirons. 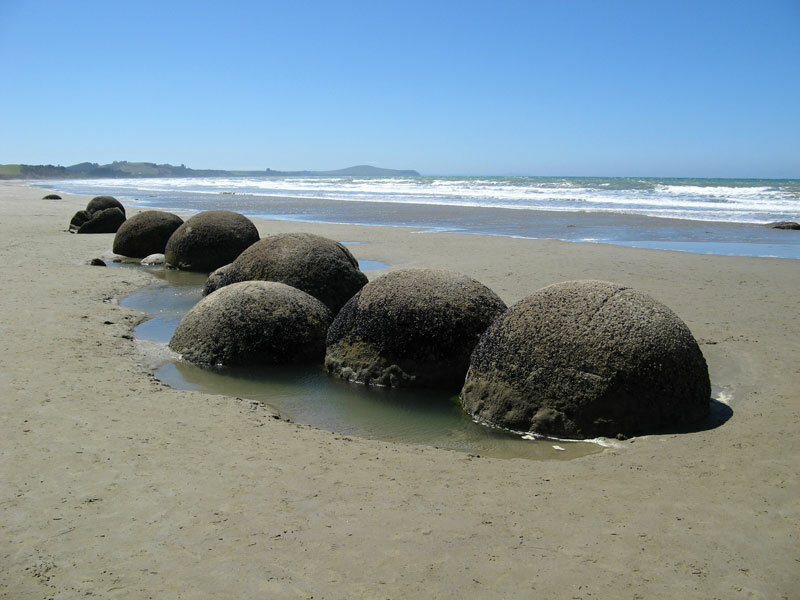 Large spherical concretions nearly identical to those at Bowling Ball Beach occur in the cliffs and along the beach on the Otago coast of the South Island of New Zealand between Moeraki and Hampden. The Moeraki Boulders are about the same size of those along California’s Mendocino coast, and have weathered out of the mudstone bedrock. They are cemented by the mineral calcite, which makes them more resistant than the surrounding rock. Geologically, these rocks are of Paleocene age or about 60 million years old. 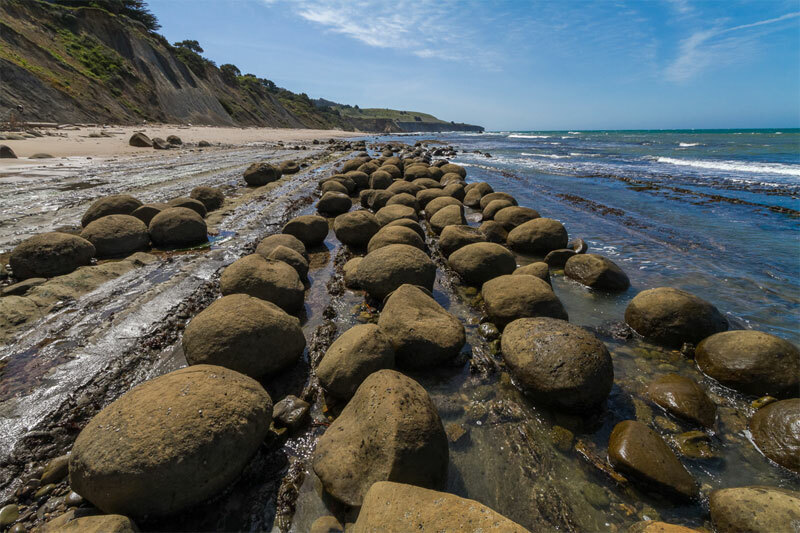 Nearly identical spherical concretions, known as the Koutu Boulders are found in the cliffs and on the beaches of the shoreline of Hokianga Harbor, on the North Island, New Zealand, between Koutu and Kauwhare points. Some of these are up to 10 feet in diameter, but again, low tide is the best time to visit.